Studio 88's Giclée prints are individually printed to order on very high quality heavyweight acid free art paper, using inks which provide the best colour and finest detail of any prints we offer. Each print is individually printed and then signed by the artist, Graham Turner, ensuring excellent quality and a picture that is as close to the original as possible. 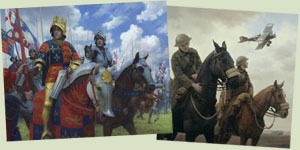 There are a range of sizes to choose from and a selection of paintings are also available reproduced on canvas. Following their charge against German positions at High Wood on the 14th July 1916, during the Battle of the Somme, the 7th Dragoon Guards take up a defensive position on the road to Longueval. Available in three alternative sizes and on canvas. Early on 13th April 1917, pilots and observers from six RE8s of 59 Squadron prepare to take off on a reconnaissance flight over the German lines - none would return. A newly trained Royal Flying Corps pilot and observer arrive at their first posting, a front line BE2e reconnaissance squadron. Graham Turner's sensitive tribute to the millions of horses that lost their lives during the First World War. Available in two alternative sizes and on canvas. A column of Indian Cavalry advance through the town of Albert, which was central to the Allied activities on the Somme in 1916. British troops signal their position to a BE2c flying overhead as they struggle to advance across no-mans land on July 1st 1916, the first day of the battle of the Somme. An RE8 struggles home over no-mans land, a thin trail of smoke behind it. An RE8 crew relieved to have landed safely after another close call while on an artillery-spotting sortie.